This is going to be amazing in limited. Was to be expected that UW would get a crappy one in this cycle. 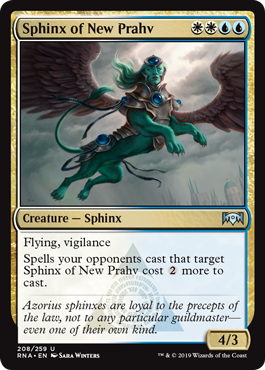 It's weird how much better crackling drake is this than the rest of this cycle. Although the rakdos one is decent as well but will probably suffer from being hard to hit in a deck with chainwhirler. Not nearly as good as the other XXYY creatures revealed so far. Total miss, especially since it still dies to Lava Coil when you need to cast this creature in order to stabilize the Board against the new R/X Aggro variant that's sure to emerge. They lose as much tempo as you if they play Lava Coil, and aggro decks can't afford it?